As someone who loves to cook, it’s a shame I’m not a better gardener. How nice would it be, I often think, to step outside with my kitchen shears to trim lettuce and herbs for our nightly salad, to pluck snap peas for snacking and cucumbers for pickling? I like to imagine my yard a sea of raised beds, to picture my days spent outside tending my mini farm, my nights in the kitchen cooking and preserving my daily harvests. It’s fun to dream, right? For now, I’ll stick with the minimalist system that has (mostly) worked for Ben and me in recent years, which is to grow tomatoes exclusively in our single raised bed and various herbs in a few pots. I say mostly because I’ve only had varying degrees of success with herbs, and cilantro, one of my favorites, has been particularly uncooperative. I recently learned why while chatting with A Way To Garden’s Margaret Roach: I haven’t ever planted cilantro seeds more than once a season. Cilantro, I learned, is a short-lived herb, meaning it’s always trying to “bolt” — to go to seed in order to reproduce. So if you want to have a constant supply of cilantro for all of your favorite summer dishes, you need to sow seeds about every two weeks. Aha! I feel more hopeful than ever that come October, when all of our tomatoes arrive at once, I’ll have homegrown cilantro and basil for salsa , caprese salad, huevos rancheros, and no-fuss enchiladas. I can’t wait. I’ll keep you posted on my herb-growing progress, and I’ll follow-up in a few weeks. In the meantime, if you’ve found yourself up to your eyeballs in herbs, below you’ll find a few herb-heavy recipes to help cull your supply. 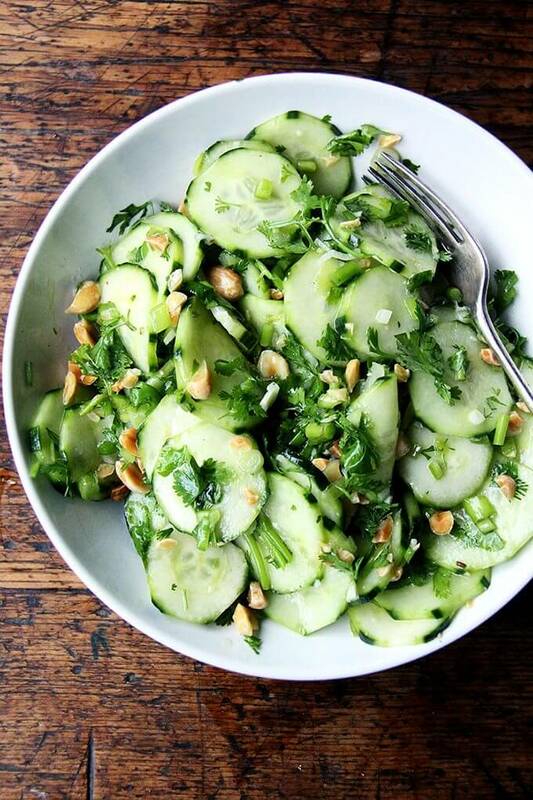 Also, the Vietnamese cucumber salad pictured above comes from Samin Nosrat’s Salt Fat Acid Heat. I made it for our pre moth-night picnic dinner a few weeks ago, and we loved it. Recipe below. I hope you all are well! What are your favorite ways to use herbs? How do you preserve them in both the short and long term?